I honestly can't say enough positive things about Donna and Tina at Blush. They were welcoming and helpful from the moment I walked in the door, and made the process so special for me and my mom. The dresses at their store are all gorgeous based on their impeccable style and I loved having the entire place to myself as they only do private appointments. 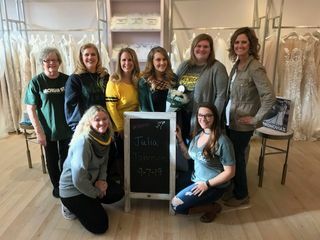 They were kind and understanding as I weighed the options of my decision, and selecting my perfect dress was even more enjoyable knowing it was from their store! I urge every bride to go to Blush Couture Bride for a truly unforgettable experience-they're the best! I’ve been to 5 bridal salons before Blush and nothing was close to how amazing I was treated there. They knew who I was as soon as they opened the door. Two sisters who own the salon and better yet they were Italian so I knew they were honest and hardworking! They did everything to make sure I was happy. They knew exactly what I wanted and gave me the dress of my DREAMS! Side note, I’m SUPER picky and not easy to please at times but they nailed all my expectations and more! LOVE this salon!!!!! Best experience! Tina & Donna are the ultimate team. I had such a difficult time trying to decide what I wanted & they didn’t stop until I was happy. They made the entire process so graceful, fun, & surprisingly easy. All I had to do was let them go to work. They literally had my back! They are so friendly and make the whole experience of buying a dress amazing! Donna and Tina were warm and welcoming. They understood my vision and helped me find the perfect dress. They have a beautiful selection with different styles. I plan to refer all my family and friends to them in the future. I went to many stores and none of them compared to Blush! The owners are sisters and made me feel so welcome, special and confident. They are true stylists who want to find the best fit and style for you. I did not feel pressured at all to buy a dress there because they are genuinely so excited for you and want you to find the perfect dress. I was overwhelmed in other stores, making me pull my own dresses when I did not know what I should be pulling, but felt so comfortable at Blush. They close the entire store for your private appointment which made the experience so special when I brought my mom, sisters and grandma. They happily let me make three appointments to try on the same dress they found on my first appointment and had complimentary mimosas for everyone when I said yes. I would recommend them to anyone looking for that special experience! I cannot wait to go back for my fitting! Love! Love! Love this boutique! Would definitely recommend to everyone. Tina and Donna were a huge help and were so focused on making me comfortable and happy. Go here for a True Bridal Experience! Can’t say enough enough this boutique!! Amazing service and friendly staff! I cannot say enough great things about BLUSH! Both Donna and Tina make you feel so special and right at home from the minute you walk into the door. They were such a pleasure to work with and they played an instrumental part in helping me find a dress. I highly recommended this boutique to anyone shopping for a wedding dress or accessories! LOVE LOVE LOVE! This was by far the best wedding dress shopping experience I could have imagined! 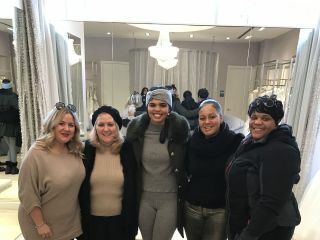 While other bridal salons left me feeling pressured and overwhelmed, the Blush owners - sisters Tina and Donna - had me completely at ease and made the process so enjoyable, as it should be! I love the fact that when you make an appointment with them, you have the entire shop to yourself so it is private and intimate with no distractions. The atmosphere of the store is wonderful - it is so bright and airy with tons of natural lighting, great music, and plenty of space, which allowed me to walk around in the dresses rather than just stand in front of a mirror. The dress selection is amazing, I could not have gone wrong with any of the dresses they picked for me, but there was definitely one that was absolutely perfect. Tina and Donna were very quick to learn my taste and what I felt comfortable in, and I truly felt that they were working with me to help me find my dream dress, rather than just trying to make a sale. After shopping at other locations as well, I cannot recommend Blush enough - they will offer you the BEST experience and service in the area! They were amazing! Took exactly what I said and found me my perfect dress! The experience was incredible and I would recommend to anyone looking for their wedding dress! So happy I purchased my wedding dress ! Amazing owners and customer service. So happy ! The team a BLUSH Couture was absolutely wonderful! From the moment I walked in I knew it was going to be a special experience. The team was warm and personable, very attentive, and very knowledgeable. I ended up with the very first dress I tried on! My Mom, sister and I want to do it all over again!! I loved my dress and the quality of service I received at Blush. I HIGHLY recommend every bride to go there because they will personalize your experience. I loved it! Donna and Tina are amazing and so fun! They were extremely accomdating and respectful of my budget. Beautiful selection of designers and dresses! I felt so confident when I ordered my dress with them. The team at BLUSH were so helpful when it came time to pick out a wedding dress! They were not only attentive but gave honest opinions about different gowns which was helpful! They made everything stress-free. They were so kind go the extra mile and serve my group mimosa’s when we found the dress! I would recommend them over and over!! Thank you Donna and Tina! This is a wonderful bridal shop where you will receive world-class, full attention! Beautiful dresses! Donna and Tina provided amazing service and helped me find a gown I LOVED. I went to multiple bridal stores in Birmingham and this one had the best service and a great selection. Elegant, Chic and Fabulous stylists with an eye for exceptional style and love for genuine service. Wonderful service! Donna and Tina were amazing! They were very respectful of my budget and helped me find my dream dress! They were very flexible and provided me with the best options! Beautiful collection of dresses that appeal to all tastes. I strongly recommend Blush Couture! Thank you Donna and Tina! Donna and Tina exceeded my expectations on wedding dress shopping.! I had no idea on what style wedding dress I would be interested in, and went into there boutique with an open mind. Thanks to the ladies at BLUSH Couture Bridal, I was in great hands. From the moment I tried on the 1st dress I felt it was the "one".! Tina and Donna knew exactly what dress would fit my body type. Not only are they brilliant with dress selection, there shop is absolutely gorgeous.!! I am so happy that I found my PERFECT dress.!! I couldn't Thank you ladies more for making the whole experience so easy! Donna and Tina are the best in the best business! It doesn't get much better than this. They're both professionals, so welcoming and know how to guide you to find your perfect look. The bridal salon is a beautiful private place to find your perfect wedding gown and very spacious for you and your guests. I would highly recommend Blush to any girl looking for her dream wedding gown. I have had the most wonderful experience working with the ladies at Blush Couture Bride. I made my very first appointment to try on dresses here in October of 2017 and quickly realized later that day that no other bridal boutique compared to this one. Upon entering the cozy space, I was greeted with a warm welcome by the owners, Tina and Donna. My eyes were immediately drawn to the decor inside--beautiful chandeliers, candles, cozy rugs, two chic love seats, a full wall of mirrors, and wedding dresses lining the walls. Romantic music played in the background as I tried on a wide array of designer dresses. The best part of my experience was that I was the only bride in there, as they schedule private appointments. I had made appointments at other salons for that day and by day's end I couldn't wait to get back to Blush Couture Bride. It felt like home! This is where I said "yes to the dress"! I will also note that every fitting appointment I made after purchasing my dress was a similar experience as my first appointment. Tina and Donna made me feel special and were so incredibly sweet and easy to work with. I highly recommend making an appointment here! You will not regret it! The owners of Blush made me feel so special during my visit at their store. Wedding dress shopping is such a fun experience and having excellent service makes it more enjoyable. I was very excited to find my dress there and it was an easy decision based on my experience there!